In this day and age, when you can’t look more than ten feet without seeing some man,Â woman or child wielding a smartphone, more and more companies throughout a vast spectrum of consumer markets are using this opportunity by implementing apps to appeal to the need for convenient shopping. The automobile industry is no exception, and both in Australia and worldwide the number of people using smartphone applications to research prospective car sales has been steadily increasing over the past few years. This trend seemed to originate in the United States around 2011, with companies such as Edmunds.com and The Car Connection reporting significant growth in usage of mobile websites and smartphone applications over the 2 year period, with Edmunds in particular reporting a fourteen-fold increase in mobile phone application usage in the two year period from 2011 to 2013, with noticeably more time also spent browsing the websites on mobile devices such as smartphones and tablets. Indeed, many prospective car buyers are clearly sold on the idea for such startling trends in usage increase to emerge, and this is something that did not take too long to arrive on the shores of Australia. 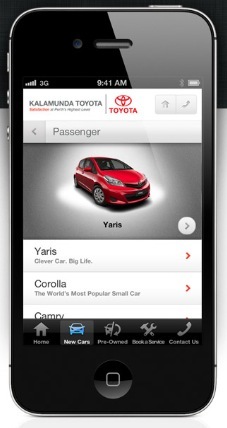 Currently available apps – such as Australian-based Kalamunda Toyota’s mobile app which can be used on Apple’s iOS products – market themselves to the twenty-first century consumer by offering all of the features available at one of their dealerships (service bookings, loan structure planning, test-drive bookings) without any of the hassle involved with physically travelling to the establishment, as they know that, more often than not, if the option is there to be able to get most of the work done from the comfort of their own home using a mobile phone (a device likely to be in frequent use as it is), then that is the option that they will choose to pursue. In addition to appealing to the innate desire for a more convenient sales research experience, these smartphone apps also tend to offer a much simpler interface. All of the relevant information (special deals, pricing structures, etc.) is often clearly presented in an easy-to-digest manner, and naturally people are going to prefer this approach to, say, having to deal with someone who may not be quite so coherent in their transmission of information, especially when coupled with the fact that these apps (such as the Kalamunda Toyota one) are free, removing the need for fuel expenditure on a potentially needless excursion to the dealership or frustrating phone call. Indeed, user-attested accounts of people who have used mobile apps to research a potential new car purchase (also readable in the previously cited article) are filled with praise, evidencing an ever-increasing trend towards the popularisation of smartphone-based market research. So there you have it. If the statistical evidence from the past two years is anything to go by, this is a trend that is not going to be bucked any time soon. As more and more potential consumers begin to explore their options with regards to finding out information relating to the purchase of a new automobile, the car companies will begin to discover and subsequently implement more and more effective marketing techniques to bring in even more new business from new and even more tech-savvy generations. It surely will not be long before the only reason you’d have to head down to the dealership is to pick up the keys.